When Katharine Tulman wakes in the middle of the night and accidentally foils a kidnapping attempt on her uncle, she realizes Stranwyne Keep is no longer safe for Uncle Tully and his genius inventions. She The thrilling sequel to Sharon Cameron's blockbuster gothic steampunk romance, THE DARK UNWINDING, will captivate readers anew with mystery and intrigue aplenty. The Dark Unwinding was one of my favorite historical reads last year, with its wonderfully gothic and mysterious mood. I thought it was a standalone, so I was thrilled when it was announced that there would be a sequel. And while I very much enjoyed A Spark Unseen, I had one big problem with it. The slow pacing. I certainly didn't have this problem with the first book - I believe I blew through it in a day. 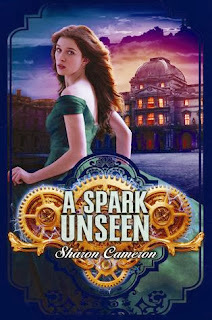 However, A Spark Unseen took me several days to read. It just seemed to drag on and on, even though it's not a particularly long book. It's not like there wasn't anything happening, since the plot is pretty well-developed. But sometimes it seemed the writing was loaded with too many long paragraphs and not enough action. Perhaps that's why the pacing felt off to me. As for the plot, it was well-developed, as I said above. But I didn't completely love it. There was really a political layer to the storyline in this book, and it made it harder to keep my attention. I felt like the first book had a much more simpler and fascinating plot. So while the plot is well-written, it just wasn't entirely for me. The characters are brilliant, as usual. Katharine, Uncle Tully, Lane - I loved them all! I really liked the support of Katharine's maid, Mary. And I liked the surprising depth of Mrs. Hardcastle; she was a character who really surprised me. I just wish there was more focus on the characters instead of the plot. I definitely feel like this sequel is more plot-driven than character-driven. But all in all, I definitely liked A Spark Unseen. It's a good, strong sequel, and I'm amazed at the attention paid to historical details. If you're a fan of historical steampunk books, then you need to read these books! I'll be keeping an eye out for more of this author's work for sure. * I received a free copy from Netgalley in exchange for an honest review.